Jean Skipper, Mixed Media Paintings, Surprise! A full moon proclaims "Surprises are hiding everywhere." 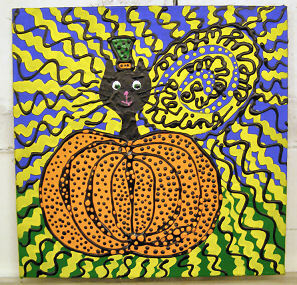 as the cutest black kittie pokes his head out of the polka-dotted pumpkin. This is an original painting, and not a print. It's created on a 8 x 8 inch canvas board using professional quality acrylic paints. There's also a lot of detail and dimension that's challenging to capture in a photo.